The Relyence RBD calculations engine computes a variety of your most vital reliability and availability metrics. Relyence RBD calculates all your most critical metrics for evaluating system performance: reliability, unreliability, availability, mean unavailability, total downtime, failure frequency, path sets, and more. The Relyence RBD calculation engine encompasses a diagram analyzer to determine the most efficient computational methods, and a mathematical engine to perform quick and accurate calculations using both exact and simulation analyses. Relyence RBD supports a large array of reliability and availability metrics. Depending on the complexity and layout of your RBD, and the selection of metrics to compute, the Relyence RBD calculation engine determines the optimal approach for calculation by analyzing your diagram. The Relyence RBD calculation engine includes both the ability to perform analytical, or exact, calculations and employ its Monte Carlo simulation engine if needed. 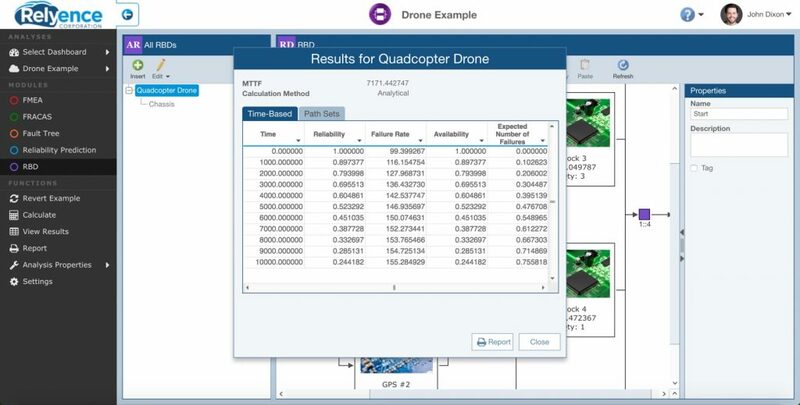 You can optionally choose to always perform simulation analysis if you prefer. 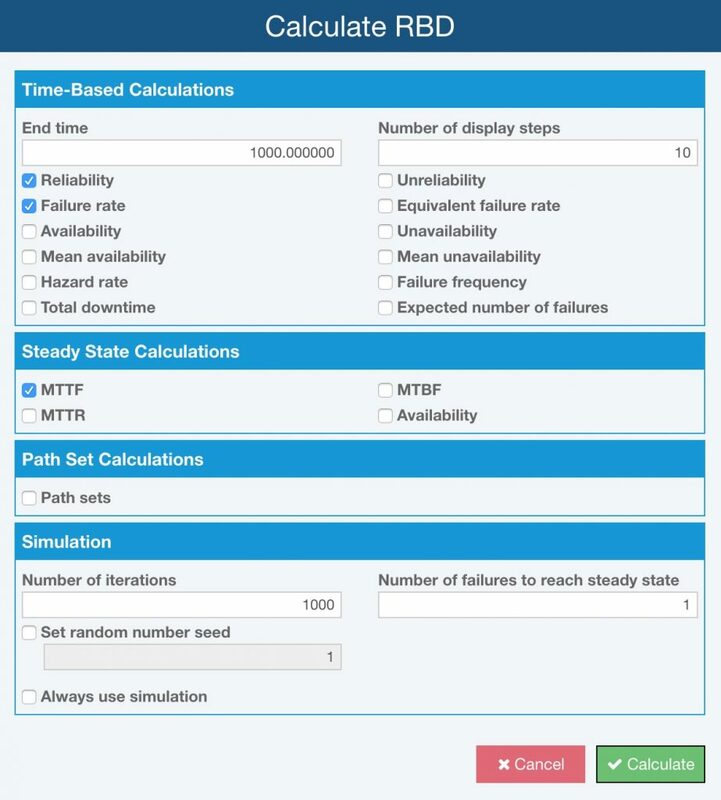 Calculation preferences also allow you to set the number of iterations to perform when using simulation, the number of failures required to reach steady state, and set the random number generator seed. Relyence RBD's calculation engine includes both analytical (exact) and simulation methods. Relyence RBD can compute path sets along with time-based results. Relyence RBD includes the ability to evaluate the Path Sets of your diagram. Path sets are the pathways through your diagram that result in a successful route from start node through to end node. Path sets are useful for evaluating the overall reliability of your system, areas where improvement may be necessary, and areas where redundancy may be helpful. Relyence RBD has a fully customizable and flexible report generator for viewing your analytical results. You can also generate a graphical report of your diagram. Both the analytical result outputs and graphical reports can be exported to a variety of formats if needed. You can view your RBD metrics directly on your diagram. The basic set of results can be displayed with each component block on the diagram. 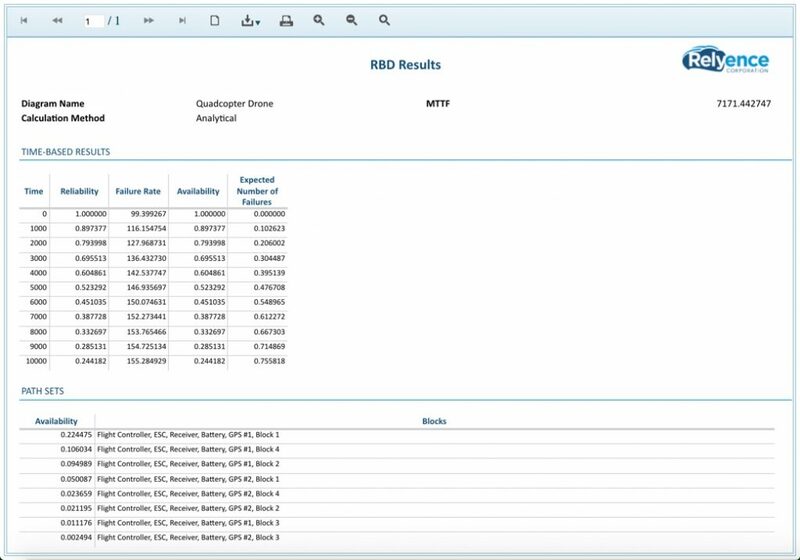 In addition, you can bring up the Relyence RBD Results window, and then subsequently click through the components in your diagram to see the complete result set for each component. The calculation results for Relyence RBD can be viewed on the screen as well as generated in reports and graphs.